Clipper ships came in use in the 1830s. They had speed but did not last long in the shipping industry because they lacked cargo space and depended on the wind for traveling. With a wooden hull and three masts, the King Philip was a 19th-century medium-sized clipper ship built in Alna, Maine in 1856 and launched the same year. She was named for Metacomet (who was known to the English as “King Philip”), a war chief or sachem of the Wampanoag Indians. Metacomet was the Wampanoag’s leader in King Philip’s War Like many ships before her, the King Philip sailed the oceans through the notorious storms of Cape Horn at the tip of South America transporting goods of value between the East coast and San Francisco. On January 25, 1878, with no cargo on board, the King Philip left San Francisco Bay under Captain A.W. Keller, bound for Port Gamble. She was being escorted out to sea by a steam-powered tugboat through the turbulent waters of the Golden Gate Strait. Suddenly, the tugboat received an urgent call from another ship close by, where there was a serious accident aboard their ship. Left on her own without the tugboat to steer her, the King Philip dropped an anchor, but the anchor did not hold fast, and the clipper drifted with the current towards the breakers of the beach and ran aground in heavy surf, which caused the ship to break apart. She lost her rudder, her keel was crushed and her timbers were smashed to pieces. Thankfully, all the members of the crew survived the shipwreck. Right after the incident, what was left of the wrecked clipper was offered up for auction and she was valued at $20,00 (almost half a million today). 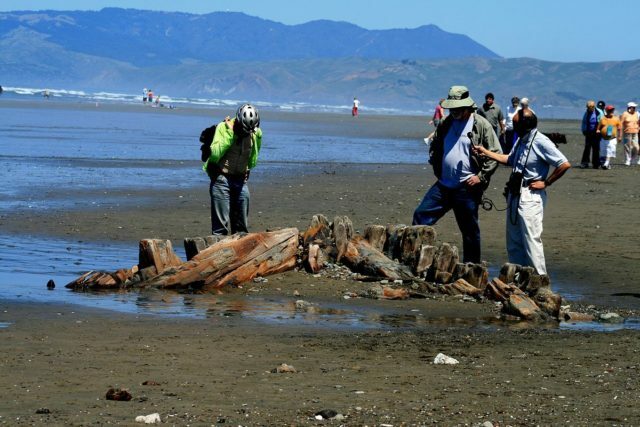 The wreck was sold to a San Francisco businessman named John Molloy for $1,050 (almost $23,000 today). The masts, sails, anchors, and brass and copper fittings were all salvaged. 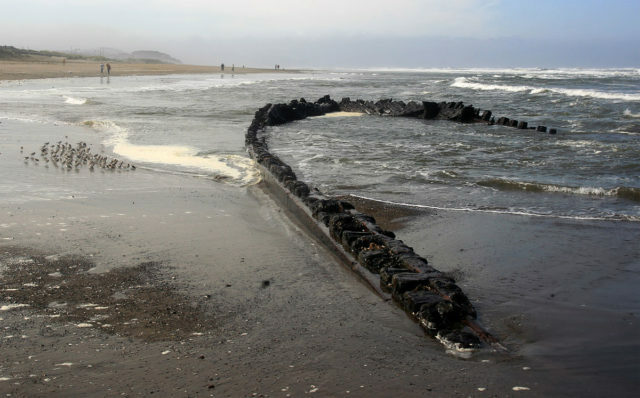 What remained of the wreck was abandoned and left to the sea. 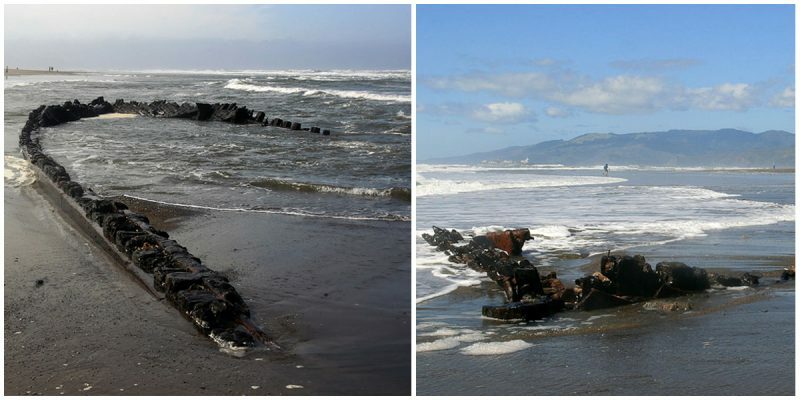 Left in place at extreme low tide level in 1878, what is left of the wreck is usually completely covered in sand. 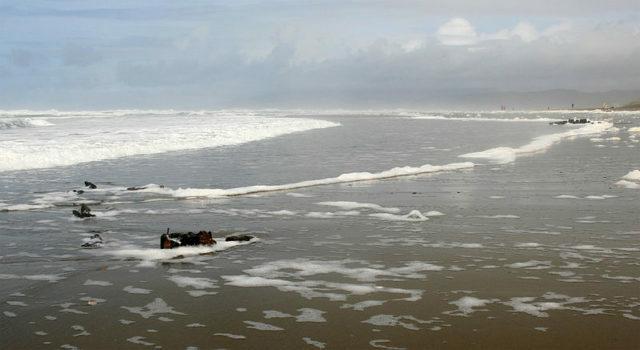 It occasionally surfaces when winter storms and tides wash away the sand.